Chickadvisor has a new campaign for new moms! 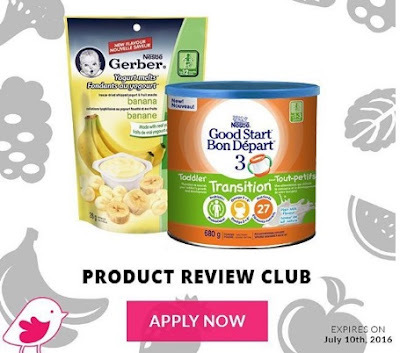 100 Chickadvisor members will be chosen to experience Gerber's toddler nutritional supplement and fun snack. The product review will be on Nestle Good Start 3 Toddler Transition and Nestle Gerber Yogurt Melts. If you're interested, complete the short survey at the link below by July 10, 2016. For additional consideration (and to let your fellow moms know about this offer! ), please include the hashtag #NestleToddlerNutrition when posting on Twitter, Instagram, Facebook, or Pinterest.